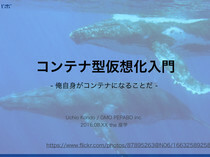 Uchio Kondo / GMO PEPABO inc.
and a system programming novice. Japan, which is a Coast city. from http://showcase.city.fukuoka.lg.jp/ all rights reserved. build doesn t support ﬁle capabilities. internal, so I had some troubles. • Provided by GMO Pepabo. • And I had a conﬂict in upgrading LXC itself!! 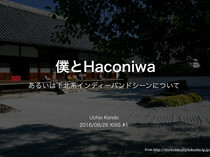 • So I have created haconiwa! • You can combine container functionalities using haco ﬁle s DSL. See comments on generated one. Let s study container with mruby! m.mount "proc", "/proc", :type => "proc"
a container (indeed a group of processes) looks like an individual OS. cpuset.cpus = "0-1"; cpuset.mems = "0"
• Traditional root has super power and this is too dangerous in some cases. • Linux capabilities is an idea to divide the privileges into distinct units. • We can choose just the necessary units for operations! 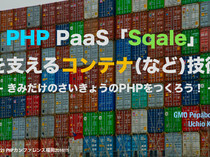 • It deﬁnes what features to be supported by OCI container. • BTW, OCI spec refers to linux and solaris speciﬁc conﬁg. • It will be released far in the future, maybe. • There were some worries! in ﬂags, and the caller is multithreaded. • A multithreaded process may not change user namespace with setns(). level system calls or C library functions. raise ArgumentError, "Options :fd or :pid must be specified"
• haconiwa binary is created under the mruby-cli directory layout, thanks! embeds this to a command. • Actually, these are already used by the hacorb example! 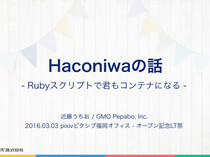 • mruby version of Haconiwa is written in just 3 months, powered by mruby! • Rest of the presentation will be used for these dreamy thoughts. • The spec will deﬁnitely change!! then the leader can watch the cluster and ﬁre the registered events. • This looks like a kernel-less, SPOF less architecture that maybe works. The containers as the cells of the organism? • This doesn't look like a fairy-tale for me. • English reviewer: by @_zzak, thanks!